An Axios journalist’s description of people who want an immediate switch to 100% renewables as “far-left” has provoked argument. Some have been bemused, some combative, and some patronising. But most people probably agree with her. A poll I commissioned for my book found that climate change is the issue most associated with the political left. Lord Deben (John Gummer), Greg Clark, Claire Perry and Amber Rudd are all right-of-centre but are serious about tackling climate change. Jeremy Corbyn is to the left of Ed Miliband but doesn’t seem any more interested in climate change than his predecessor. Ukip aren’t particularly to the right of the Tories but are vastly worse on climate change (want pull out of the Paris Agreement etc). The TUC is left-of-centre but doesn’t take climate change that seriously – backing high-carbon projects like a new Heathrow runway. The problem comes from thinking along only one axis, the economic one. If we expect everyone who’s left-wing to be worried about climate change, we’ll keep on finding contradictions. Instead, we should pay more attention to another axis, variously called internationalist-nationalist, open-closed, liberal-illiberal – and Remain-Leave. Look at this YouGov poll. The single best predictor that someone’s interested in climate change is that they oppose significant reductions in immigration. The next best predictor is that they oppose the reintroduction of capital punishment. Of the three parties’ voters, it’s Lib Dems, not Labour voters, who are most interested in climate change. Supporting the more left-wing party doesn’t mean you’re more worried about the climate. The people who are most worried about climate change are most likely to be the ones in the top half of the two axes – the internationalist, open, liberals, Remainers. This isn’t to say the left-right axis is irrelevant. As a general rule, the more left-wing someone is, the more likely they are to be worried. But it’s a stronger rule that the more internationalist they are, the more worried they are. It explains all the contradictions we saw above. Their northerly positions on the open-closed axis tell us why Lord Deben and co are worried about climate change while Ukip don’t care. We keep on missing this, because the term “left-wing” tends to be conflated with the top-left quadrant, while the term “right-wing” tends to be conflated with the bottom-right quadrant. But that leaves out many people. This probably helps explain why polls that ask people where they are on the left-right scale and what they think about climate change find that self-identified left-wing people are much more worried about it (eg here and here). The two axes are important for understanding how to talk about climate change to people who aren’t already worried about it. 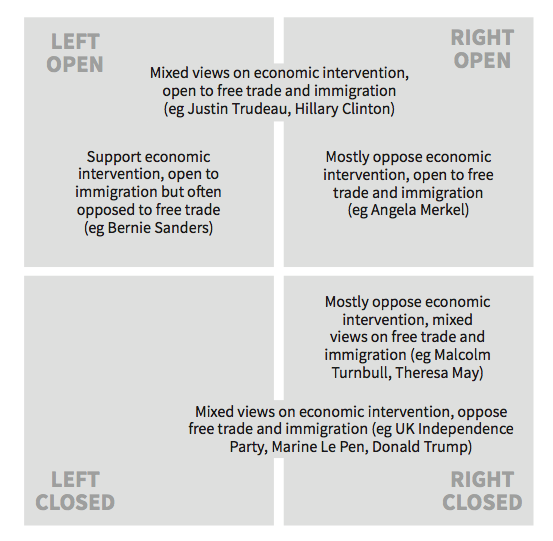 One lesson is it doesn’t make sense to ask what the left or the right – even the centre-left or centre-right – think about climate change, without also thinking about what you mean on the other axis. If you’re talking about climate change with someone in the top-right quadrant – think George Osborne – you might expect them to be sympathetic, but perhaps worried about the economic costs. 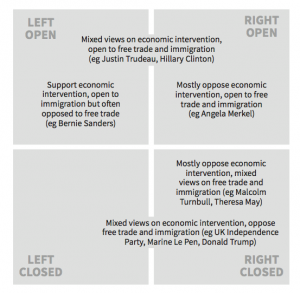 If you’re talking to someone in the bottom right quadrant – say Theresa May – you might expect them to be less interested, but perhaps persuadable on the basis of national interest. It’s clearly wrong to say that wanting 100% renewables right now is far-left. If there’s any point on the political axes that predicts that view, it’s more like extreme-internationalism.